A tasty cocktail of creole pineapple and coco. 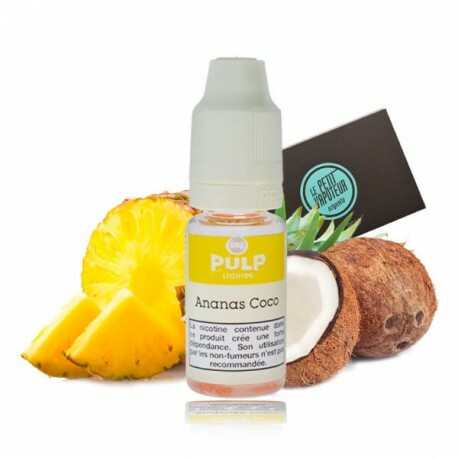 PULP Premium e-liquids are produced in France. The aromas used are certified to meet food industry standards. They do not contain either diacetyl, or paraben or ambrox. 70% propylene glycol and 30% vegetable glycerine. Propylene glycol & vegetable glycerine have the property of generating vapour. Food flavourings impart all the gustatory flavours. The nicotine is in the form of a nicotine liquid that increases the hit (sensation of contraction in the throat when the vapour passes through). Guaranteed without diacetyl, without paraben, without ambrox. PULP e-liquid is compatible with all brands and models of electronic cigarette, cigar and electronic pipe. What nicotine content to choose? 18 mg for heavy dependence. For optimal preservation of flavours, keep your PULP e-liquid away from the light, in a dry place and at an ambient temperature of around 20°C. Mélange sympa, mais goût pas assez prononcé pour ma part même après aération du produit pour le faire maturé d'avantage.